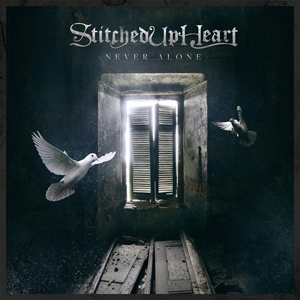 STITCHED UP HEART’s debut full-length offering, Never Alone, is set for a June 17th release via Another Century. The group has debuted their explosive new video for their new Active Rock single, “Monster”. You can view the clip now on KNAC.COM right HERE and don’t miss STITCHED UP HEART out now on tour alongside label-mates LACUNA COIL, 9ELECTRIC and PAINTED WIVES. Stay tuned to https://www.facebook.com/StitchedUpHeartRock for all additional information and new tour-dates. Mixi (vocals) states: “The track, "Monster", was the very first song we wrote for the new record with Another Century. The night before we went in the studio I was getting tattooed by my artist ‘Mr. Monster' and he asked me to write a song for him. That's where the idea started. The next day the producers, Merritt (our lead guitarist) and I met up to start the writing process. The studio was dark with spell books, herbs, spices and other various weird ritual stuff. There was an odd feeling that overcame me, almost like a beast was ready to be set free. I'm not sure if it had anything to do with the environment, our determination to kill this record or the mass amounts of monster energy drinks I had that day, but something came over me and was unleashed into the recording. Whether we're ducking and dodging life's often cruel barrage, embracing a moment of calm at the center of a storm, or simply looking for the strength to make it through the day, STITCHED UP HEART have delivered the soundtrack for a life worth living. Turn it up, because we are never alone.